The Bible tells a story. It’s a beautiful account of God’s love for people throughout history. The events told in the Bible are exciting, tender, and at times awe-inspiring, but often the story can get lost among the laws, genealogies, prophecies, poetry, and instructions. Sometimes we need to get back to what happens in the Bible, focusing on the plot and the characters. 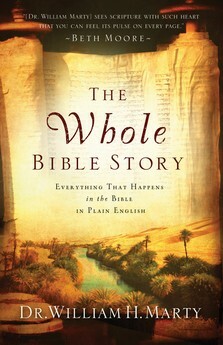 Here, Dr. William Marty retells the entire story in the Bible in one easy-to-read, chronological account. All the stories you remember from childhood–Noah, David, Esther, Daniel, and, of course, Jesus–are part of one grand narrative. And it’s the page-turning story of God’s pursuit of you–one you’ll want to read again and again. I’ve been sitting on the fence about this book. My initial excitement over receiving it quickly waned when I began reading it. After a few times of opening and closing the pages I realized I wasn’t taking into consideration the author’s intentions for his book. The heart and soul of God’s living and active Word is missing from the pages. Even though I’m disappointed with the lack of depth of The Whole Bible Story, I want to thank Dr. Marty for making realize how much I cherish the Word. I understand Dr. Marty has written for a specific audience and that his book has it’s place on the bookshelves, but it saddens me to think that people, not necessarily the intended audience, may not dig deeper into God’s Word. The Bible is not just a story. It is “living and active. Sharper than any double-edged sword, it penetrates even to dividing the soul and the spirit, joints and marrow; it judges the thoughts and attitudes of the heart” (NIV Hebrews 4:12). *Dr. William H. Marty (ThD, Dallas Theological Seminary) is Professor of Bible at Moody Bible Institute and has published two textbooks, Surveying the New Testament and Survey of the Old Testament. He is unique among Bible college professors in that he teaches and writes on both the New and Old Testaments. Dr. Marty lives with his wife in Chicago. **The Whole Bible Story was provided to me free from Bethany House. Great Review! I just recently picked ths book up and I must admit, it is very interesting and easy to follow. I just love that for many of us who grew up listening to these stories over and over can appreciate the stories we have grown to love and the ones that confused us to say the least and to see it written so plain was a delight. I also love how the Author makes it plain enough for the person who is just being introduced to the Bible can follow along as well.